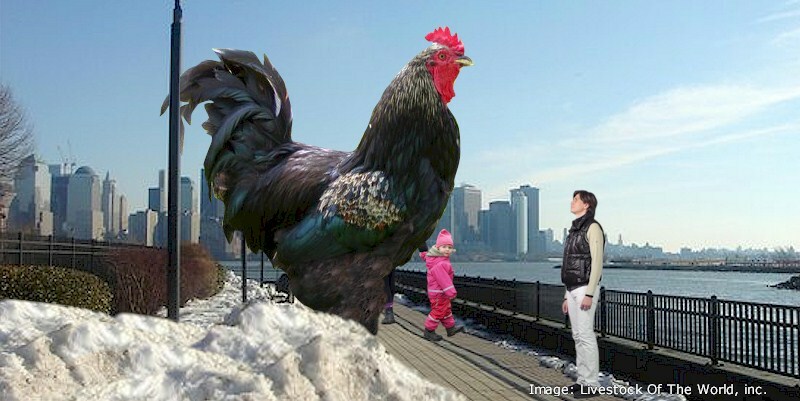 Jersey Giant chickens have a docile disposition. The roosters show less aggression than other breeds. Jersey Giants tame easily, eat out of a human hand, and run toward a person for a good petting. They do well in confinement. Jersey Giants make great pets; however, small children may feel intimated by their size. The American Poultry Association (APA) recognizes the Black, White, and Blue Jersey Giant. The most common Jersey Giant, The Black, has a solid black plumage with a green hue. They have a large red comb of the single configuration, medium red wattles, and medium red earlobes. Black Jersey Giants have a yellow carcass covered by their plumage but visible on the bottom of their slate gray feet. The Whites look like the Blacks except they have white feathers and yellow legs. Blue Jersey Giants, just recently accepted by the APA, have grayish blue feathers with a dark lacing and black hackles.